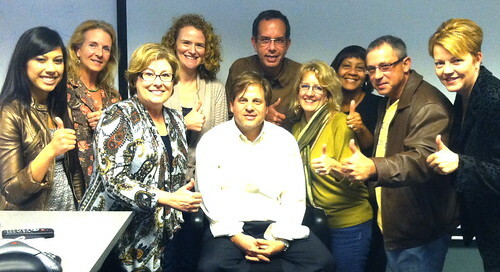 I conducted a Social Media Training in Chicago yesterday as part of my Hands On Training tour with Social Media Today. I had senior executives and C suiters from the corporate sector, nonprofits, B2Bs and agency principals attending. Here’s a picture of me with some of the attendees at the end of the session, who all seemed very happy. I’m very excited about his new workshop. I think its definitely got legs. After 7 years leading Social Media Boot Camps all over the world, I wanted to add this new workshop to my roster to focus more on applied social media communications skills. Once you know what social media is and why it’s important, you need to learn how to actually use it effectively. Most people know by now that search engine optimization is important, but how do you actually learn how to do it? How do you learn keyword discovery, how to use embed codes, how to add Facebook Like buttons, Tweet buttons, Linkedin Badges, how to launch Facebook pages, use Tweet and Follow buttons and use Linkedin Answers, Signal and Groups? How do you launch a blog? Bloggers know this stuff already. But most people don’t blog. There’s a whole wide world outside the tech bubble that can really benefit from learning these skills. The problem is, there’s a very real dearth of practical soial media training opportunities. A hotel conference center with anemic Wi-Fi, not enough power strips, banquet chairs and round tables is no way to conduct a computer training course. But unfortunately, these types of conferences are all most people know about, and their only option for learning how to use social media for business. I’ve been on the conference circuit for years and I’m here to tell you that while you may hear motivational speakers, interesting success stories and provocative, high-level theory about why social media matters and where it’s headed, you’re unlikely to get any practical know-how. The war against digital illiteracy will not be won through keynotes or PowerPoint. What’s required is hands on training. Because at the end of the day, somebody has to actually do the work. I put together a comprehensive, balanced cirriculum covering all aspects of social media communications, so attendees can get the skills you can put to use immediately. No hotel conference centers. I teach at computer trainng facilities with reliable broadband, proper seating, ergonomic desks and enough power strips to go around. No PowerPoint. No canned demos. All exercises are conducted live. And if you need help securing an internet connection, there’s a certified Microsoft network engineer on-site to resolve your issue. Attendees bring their computers, logon and get real world experience learning to use social media for business. Or for those government or military personnel with locked down laptops, we provide desktop a computer they can use for the session. I’ve been wanting to teach this class for a long time. And I’m really glad it was received so positively. My US tour wraps with a final session in San Francisco tomorrow and Friday. But given the positive feedback, I expect to announce dates for additional sessions in the coming weeks. In the meantime, I publish my training calendar here. Or, if you’re based in Europe, join me for my German-American Social Media Boot Camp in Berlin October 10-11, 2011. In my upcoming social media training in Germany, I will be adapting the cirriculum to feature local case studies and examples. In fact, as part of my research to prepare, I recorded a Social Media in Germany panel last wel with Thomas Praus (@stylewalker), Oliver Gassner (@oliverg) and Sebastian Vasta (@sebastianvasta) who are all social media specialists in Germany. If you’d like to down that panel as a podcast, here’s a link. Enjoy and hope to see you in Berlin! Thanks to all who attended, and if you have a moment, please share your experience at the session as a comment to the blog. Would you recommend the session to others? (PHOTO BY POOJA) Pictured left to right are Sarah Theresa (@sarahtheresa), Reed Evans (@GreenActionGal), Lydia Baehr (@LBPR), Moyra Knight (@moyraknight), moi [seated], Peter Vukosavich of Studio V Design, Annette Howard, Erika Roberts (@JigGarden), Jim Papariella and Sherry Bale.